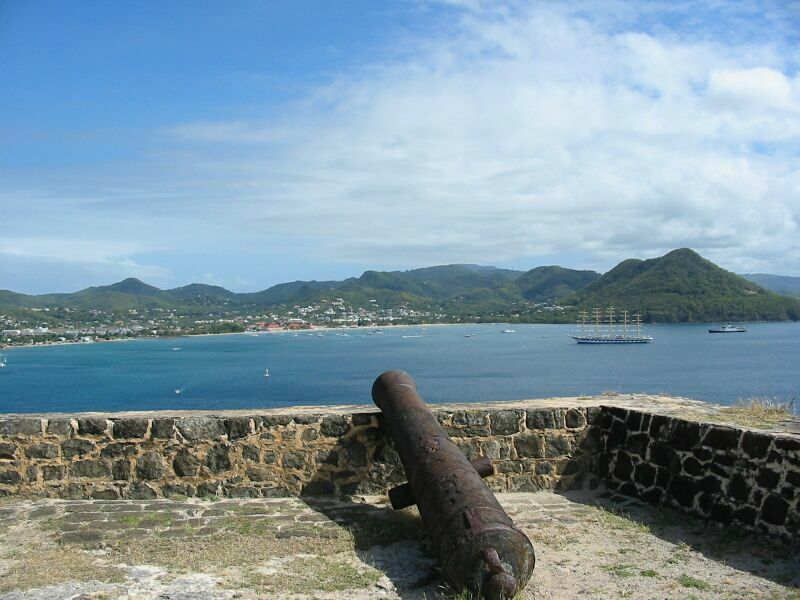 St. Lucia is a British West Indies island. 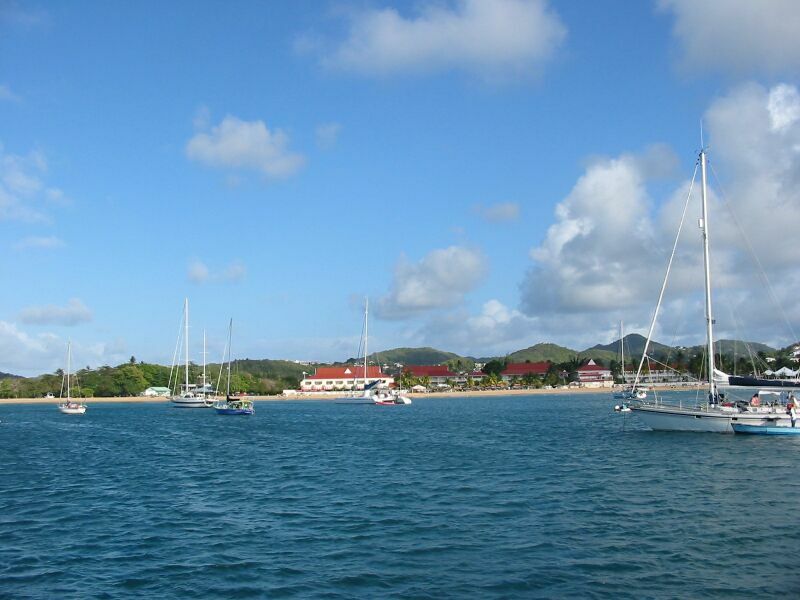 The main port for cruising boats is Rodney Bay on the northwest side. 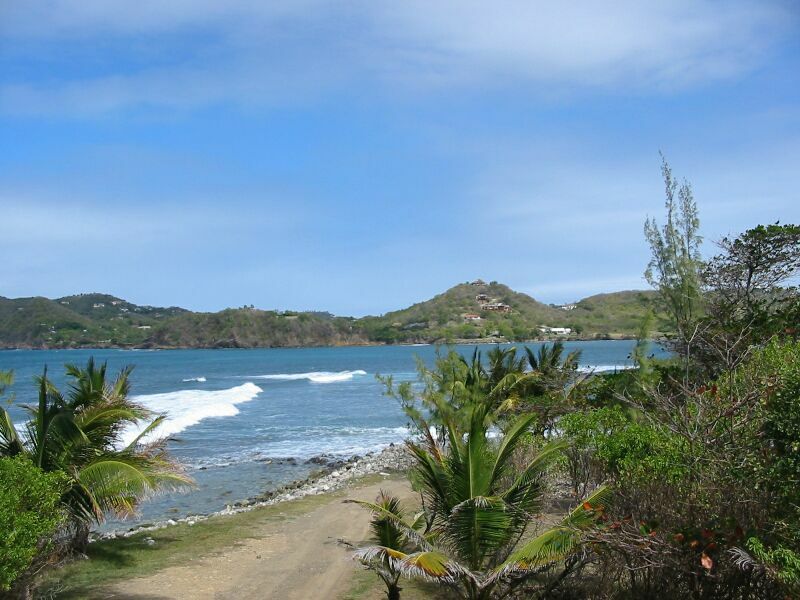 Rodney Bay is named after Admiral Rodney who fought the famous Battle of the Saintes against the French and won. St. Lucia is more populated than the rest of the BWI islands we visited. It has seen a lot of growth recently due to increase in tourism, and there are lots of new resort hotels, and more modern facilities like shopping malls, and better grocery stores. Rodney Bay has an outstanding marina with quite modern facilities and lots of services located in a lagoon inside of Rodney Bay. 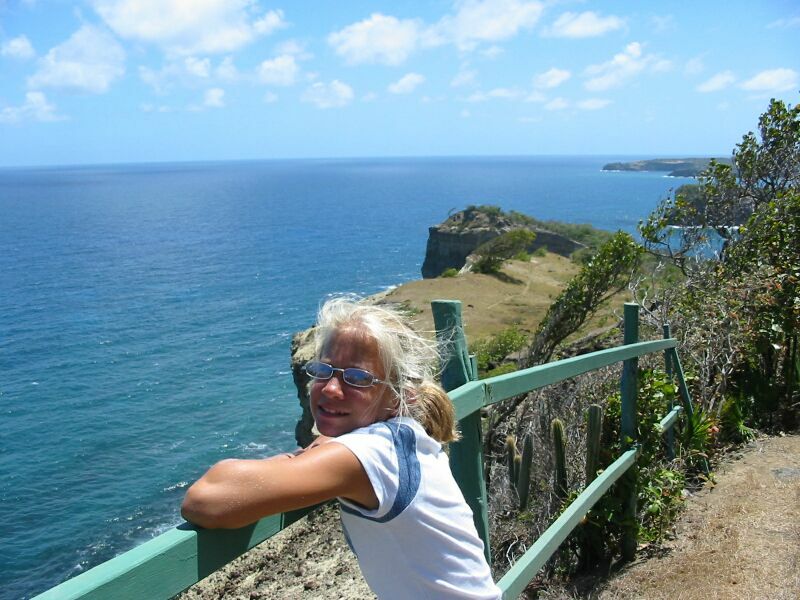 We had a nice time in Martinique, but were ready again for an english speaking country. 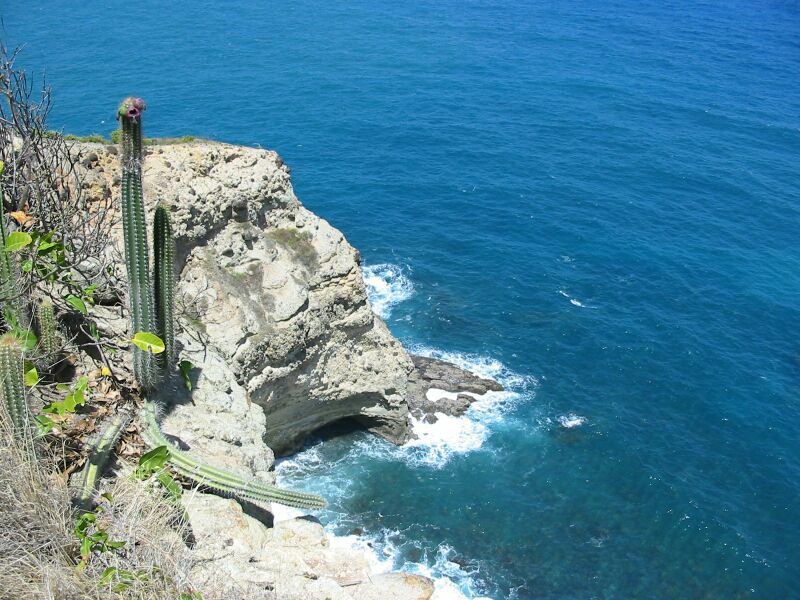 Frank hoped to find a metalworker in Rodney Bay to work on the damaged stanchion. Frank took the dinghy to Marin from St. Anne to clear customs. On the way, he stopped at the boat yard and disposed of the used oil. We left St. Anne shortly before 9:00 AM. We had good winds - about 15-20 knots apparent average the whole way. This was nice sailing with wind on the beam or slightly behind it. So, even with the wind less we averaged 7.5 - 9 knots. Seas were only about 4-6 feet off the port beam, so it was relatively smooth sailing compared to our usual passages. To compensate, there was an amazing amount of sailboat traffic between the two islands. We had to steer clear of three boats going opposite (on starboard tack - so they had right of way). We had two lines trolling the whole way. 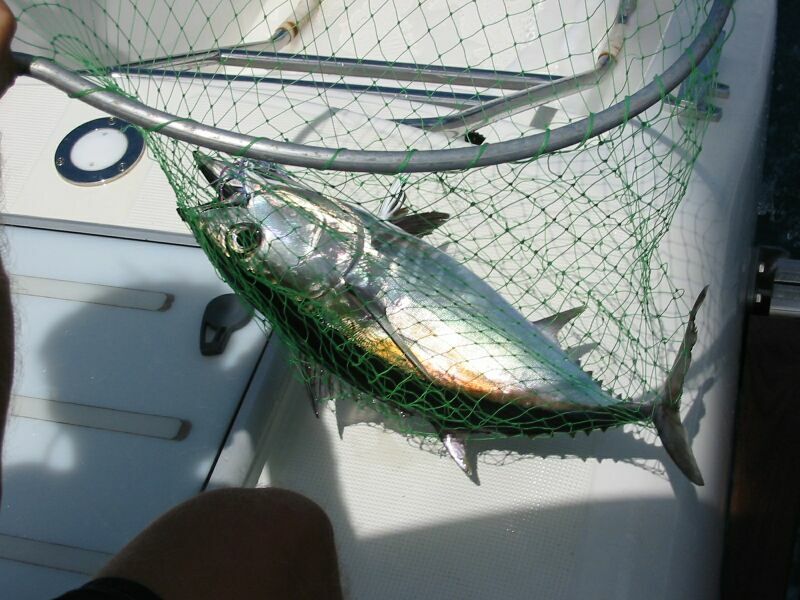 Just before getting to St. Lucia's shallower waters, the rod went WHEEEEEEEEE. This was at about 11:30. We steered into the wind to slow down and Frank started reeling in the now bent over rod. Shortly we saw we had a silver fish with black on the top. It was definitely a game fish. We got it on board, and realized we had a nice black fin tuna. Gave it some rum to put it to sleep and slipped it in the cooler. Fresh tuna fish for a few days! We arrived plenty early in Rodney bay - about 12:30, so we decided to keep sailing down the coast so we could make more water with our watermaker. 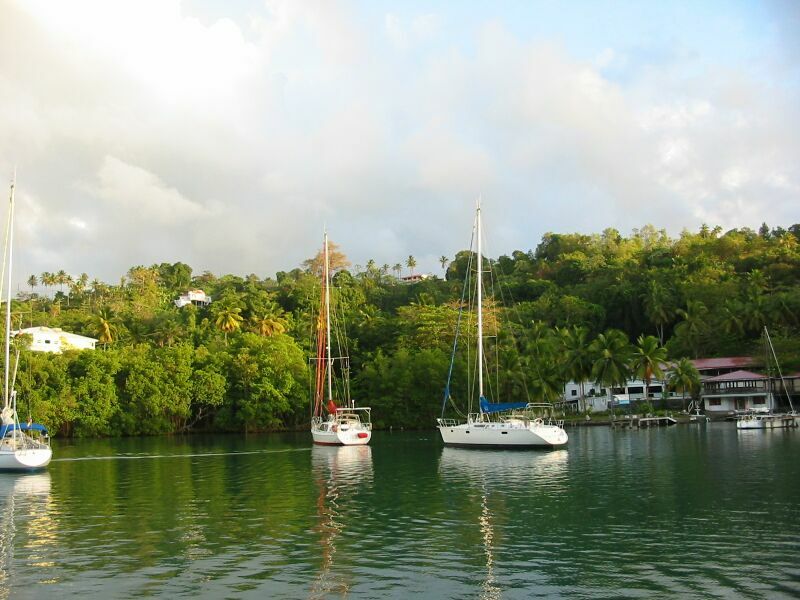 We sailed an extra couple of hours, and then headed into Rodney Bay. We had sailed 43 miles. Frank went ashore and cleared customs, and then came back to PatiCat and cleaned our fresh fish. Needless to say, we had fish for dinner. Frank was surprised it tasted just like tuna fish. Somehow he was expecting it to be gamier since he had to catch the thing. 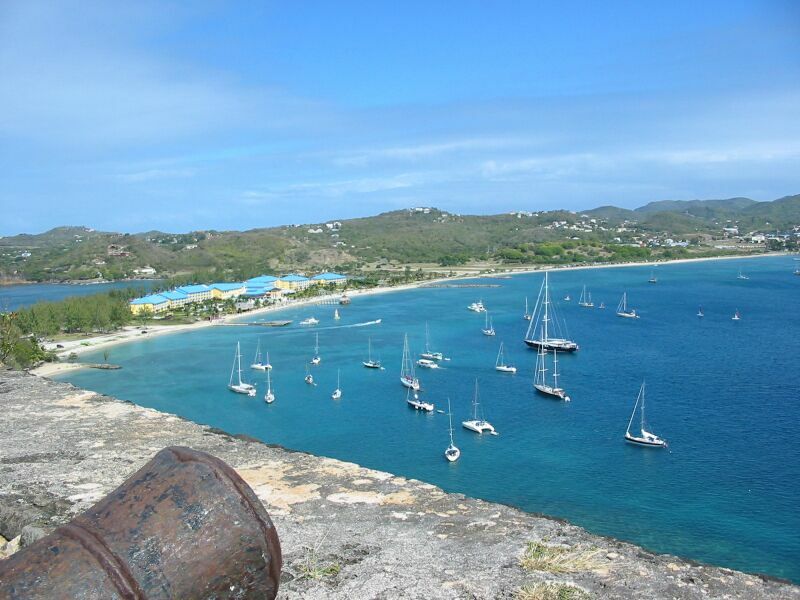 Here's a picture from our anchorage in Rodney Bay - notice the nice beach. The next day after teaching school, Frank went ashore to find a metal worker. After explainer our need, he agreed to have Frank pick him up at 12:00 to help take the stanchion off so he could work on it. Frank took off the stern light, the lifebuoy, fishing rod holder, and some rigging in preparation. It took about an hour to get it off. Gregory, the metalworker, said he could have it ready by 11:00 the next morning. He warned he'd have to cut the stanchion in at least one place. Meanwhile, Karen taught the girls homeschooling. The girls and Frank later did some swimming. Then we all went ashore and found a nearby fairly modern mall, complete with bookstore, grocery store, clothing stores, and Kentucky Fried Chicken. We got some provisions and checked out the place, then returned to PatiCat. The next day, we went ashore and took our dirty laundry to a laundry service. Frank spent some time at a marine chandlery and got some needed items - but, not all as usual. Back at the boat, Frank did some minor maintenance while waiting for 11:00 to roll around, when he went to check on the stanchion. Gregory wasn't going to be ready until 2:00 he said. So, Frank went back for lunch. Karen worked with the girls on homeschooling again. Frank went ashore to make rental car arrangements for the next day. We coudn't get one until noon. But, we figured we'd keep it 24 hours and split our plans over two days. At 2:00, Frank went and looked at the progress. It appeared the base of the stanchion wasn't shaped properly. The weld work looked good, but needed polishing. Frank ended up working all afternoon with Gregory going back and forth between the shop and the boat to get the stanchion fitted. Frank learned a great deal about metal working in the process. Lots of banging, bending, and literally jumping on the metal to bend it in shape. He also ended up holding a blow torch to help heat the metal in places to aid the bending process. Finally, around 7:00 we finished getting it installed on the boat. Karen and the girls were ready for dinner at this point and surprised Frank by saying they wanted to go to the KFC. So, we took Gregory back to his shop after dropping by an ATM and paying him in cash. It cost about $275US - not bad when you consider the amount of time involved - and this includes a meal Frank bought Gregory and a tip he paid him. The next day, Frank finished re-assembling the stanchion. Re-installed the stern light and checked that it worked, and re-installed the lifebuoy, fishing rod holder and other rigging. It looked like brand new - only a discerning eye would recognize the slight warp in the shape. At noon, we went to the rental car place. The car wasn't ready yet, so Frank went to the nearby Internet cafe and checked e-mail. After half an hour, it was apparent they wouldn't get the car. They made arrangements for another car at 9:00 the next morning. Oh well, you have to be flexible in the islands. So, that afternoon we took the dinghy to the Rodney Bay National Park which is located on the site of the old Rodney Bay Fort. We had lunch at the nearby restaurant, a bit pricey - but, good. We then walked to the museum. Frank was disappointed because the video display depicting the Battle of the Saintes was out of commission. We also found out the fort on top of Signal Peak was off limits due to a recent brush fire which burned rails on the trail. However, we were told you could go at your own risk. Frank and Karen made the climb, the girls were too lazy. The view from up there was fabulous. Here are some picture from the park - the first is a shot of the coast on the other side, next the museum (a faithful reproduction of part of the original building), and two shots of Rodney Bay from the top of Signal Peak - the second shows the Sandals Hotel. We once again were treated to loud parties on shore during the evening - this was Carnival weekend. The next morning, Monday, March 3 - that's 03/03/03 - we went ashore to pick up the rental car. We actually got picked up by a guy running a seperate rental car company by the mall on the other side of the lagoon (a one man operation) and filled out his paperwork. We were then free to drive our right-seat-driving car on the wrong side of the road. We first stopped to get a couple of gallons of gas. We kept driving until we got to the road which goes over the mountains to the east side of the island. The road was pretty nice for an island road, and there were some straight areas where you could go faster. Frank had the girls going for a minute when he showed them we were going over 100 on the speedometer - until he explained it was in Kilometers Per Hour. Beautiful rainforest lined roads, not too many curves, and the communities did not look nearly as poor as in Dominica. We drove another few miles and finally arrived at our destination: the Mamiku Gardens. It turns out these gardens are located on a Banana plantation which has a long history. 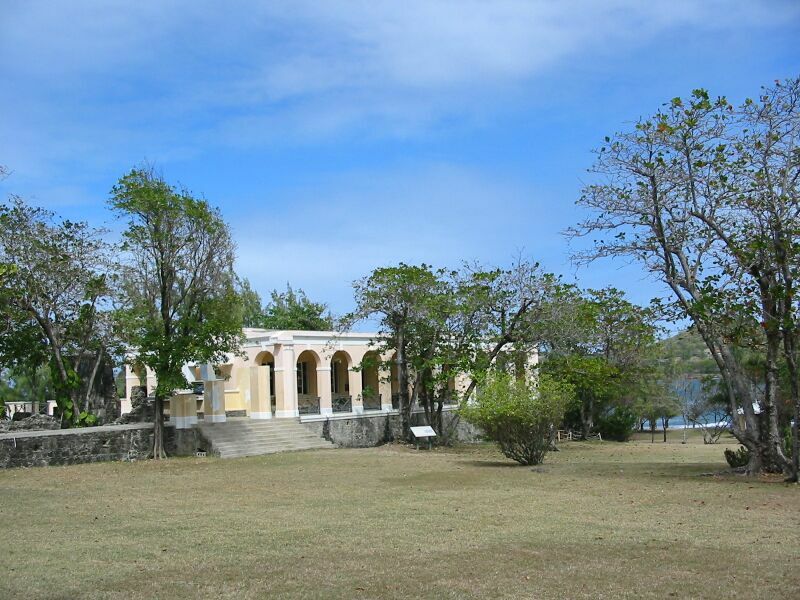 In the late 1700s it was owned by Baron de Macoud (pronounced Makoo - it's French) and his wife Madame de Micoud. It stayed in the Micoud family for 50 or so years - mostly under Madame de Micoud as her husband was killed in war. Hence, overtime, the name became Mamiku. Since the turn of the 20th century it has been owned by the Henderson-Smith family. A few years ago, they turned the area of the original estate into a garden for tourism purposes. It's a nice garden, and they have made the site of Madame de Micoud estate a historical site. The views from there are very nice. 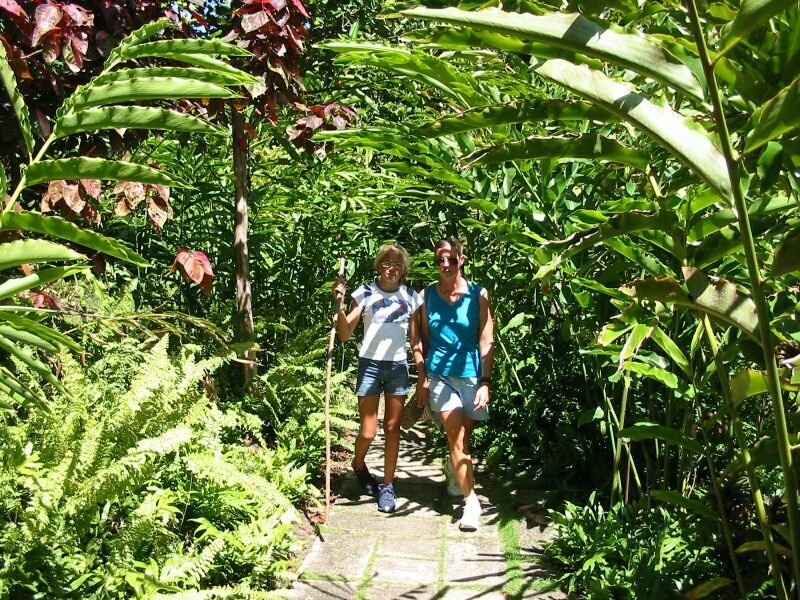 We had lunch and walked the gardens, and then back in our car we drove back to Castries. We had thought about going to the museums there, but there was a cruise ship in port and it looked crowded. We decided to find an ice cream place instead. We found a shopping plaza, but instead of ice cream we found a nice bookstore. Several books and magazines later, we went ahead back to the Rodney Bay Marina where we knew a good ice cream store was located. Since we still had plenty of time, we went back to the mall and did some more shopping as it was near the rental car place. After we got back and returned the car, Frank and Patricia went to the marina to visit the Internet cafe with the laptop. There Frank downloaded everyone's E-mail, the weather, and financial stuff to the laptop and caught up on news, etc. Patricia wanted to drive the dinghy back, but as she went to step on the dock to unlock the dinghy her foot went right through the slats. She was fortunate only to have some scrapes on her leg - no splinters or broken bone. As there were some people sitting right nearby, she bravely didn't even cry. She said it didn't really hurt. 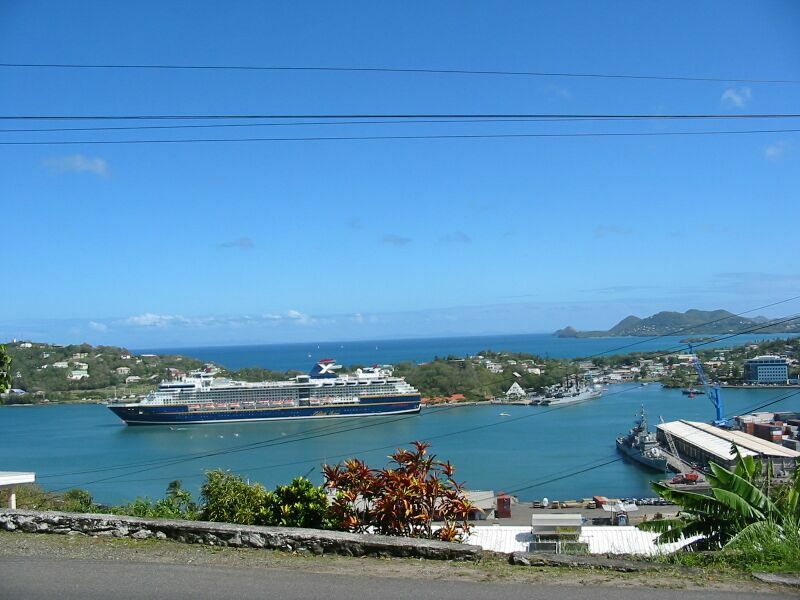 On Tuesday, March 4th, we finally departed Rodney Bay. 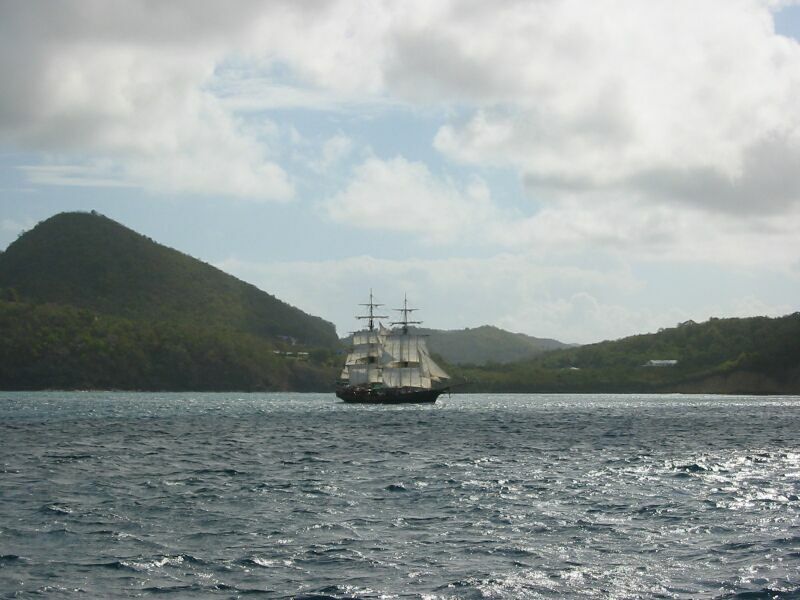 We sailed down the coast a bit to Marigot. This bay is very hidden with a narrow entrance between huge cliffs. Once inside, there is a beautiful little anchorage surrounded by Mango trees, a couple of small hotels, a nice customs office, and a few restaurants and bars. It is a favorite spot for cruisers from all over - the French particularly seem to like it. 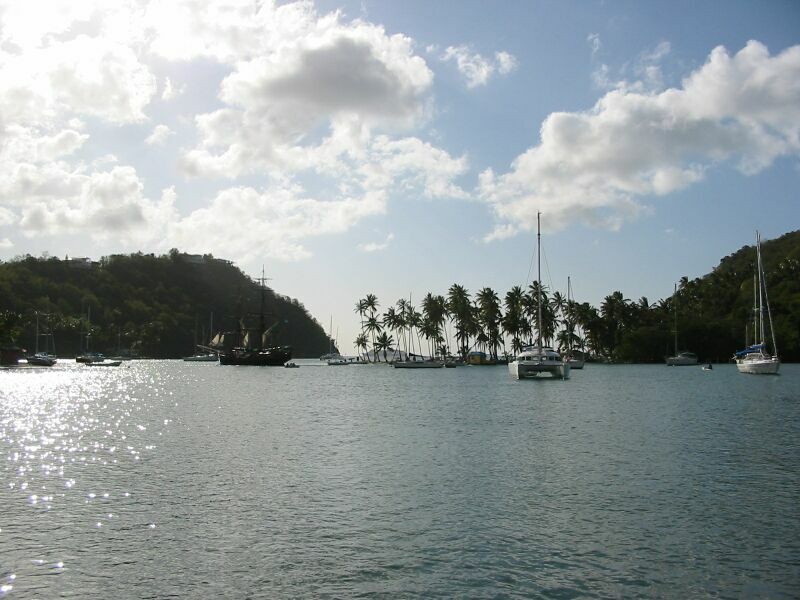 Marigot is so hidden, that a British Admiral once hid a small fleet of ships and disguised their masts with coconut leaves - a passing French fleet didn't notice them. One annoying thing about Marigot, before we were even halfway into the bay, boat boys started approaching us wanting to sell bananas, etc. Frank doesn't like being approached while navigating in new waters so he shooed them away. The anchorage is a bit tight, especially with all the other boats, but another catamaran weighed anchor, so we took his spot. We arrived at about 10:30 AM. And the first thing we did was to take Karen to the hotel - Oasis Marigot - to check on horseback riding. The Oasis hotel is built on the side of a hill, and the only way to get there is by ferry or little boats (or swim) across the Marigot bay. They have a little trolley that goes up the hill so people won't have a heartattack climbing the stairs. The girls loved the little trolley. We met Nadia, the Hotel Coordinator, she arranged for us to join two of her hotel guests at a horseback place the next day with a departure time of 8:15 AM. We went back to our boat and did home schooling. During the afternoon we were approached by 8 or 10 boat boys and water taxis. It gets annoying after a while, but we tried to be friendly. Here is a picture of what it looked like from the back of our boat (facing west out to sea), a shot looking south in the anchorage, and a shot later after sunset looking west again. The next morning, Wednesday March 5th, we got ready and went ashore by 8;15, but someone was waiting to tell us we had to wait for the 11:15 slot. So, while waiting, Frank went to get a clearance for departing St. Lucia the next morning. At 11:15, we went ashore and found our ride. We had a delightful taxi ride through the mountains above Castries to get to Country Saddles - the horse stable - which is on the North East side of St. Lucia. 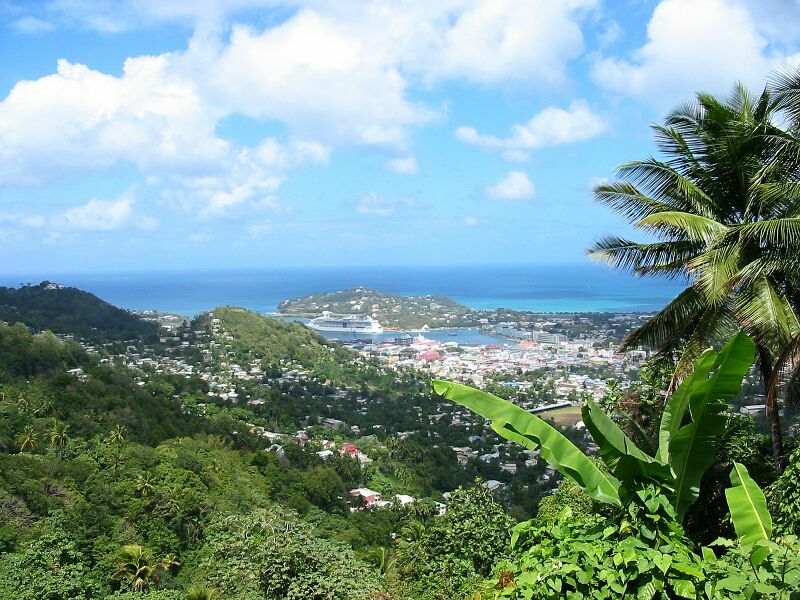 The ride up the mountains was provided splendid views of Castries, Rodney Bay, tropical forests, the local communities and schools, and the people. The communities were a wonderful example of island living and most beautiful situated in the rainforest enshrouded mountains with flowers blooming everywhere. Frank wished he could stop our ride to take lots of pictures, but we had to continue or the girls would go nuts. Eventually we stopped climbing (the map says it was only 1850 feet, but it felt more like 3000), and started down the other side. Our driver pointed out the red roofs of the stable houses and said we had some rough roads to get there. Sure enough, the dirt/rock roads were very rough and needed some serious maintenance. We went right through a banana and coconut plantation on the way. The taxi driver had to go extra slow and it took about 20 minutes to go the 1.5 or 2 miles to the stable. Frank could have walked it as fast. The owner of the Country Saddles Stable was an American who has lived in St. Lucia for 20 years and had the stables for the last 9. She did an excellent job of explaining what we needed to know to ride her horses here (obvious experience from tending to cruiseship customers). 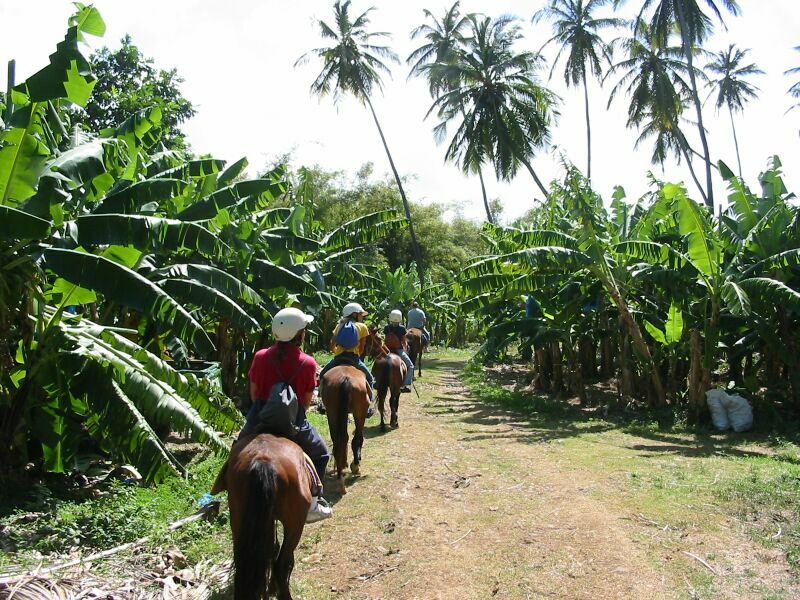 We had a pleasant ride along a river and through the banana plantation to the beach. Then did some trotting and cantering along the beach. The beach was a bit of a disappointment as it had lots of trash scattered about. 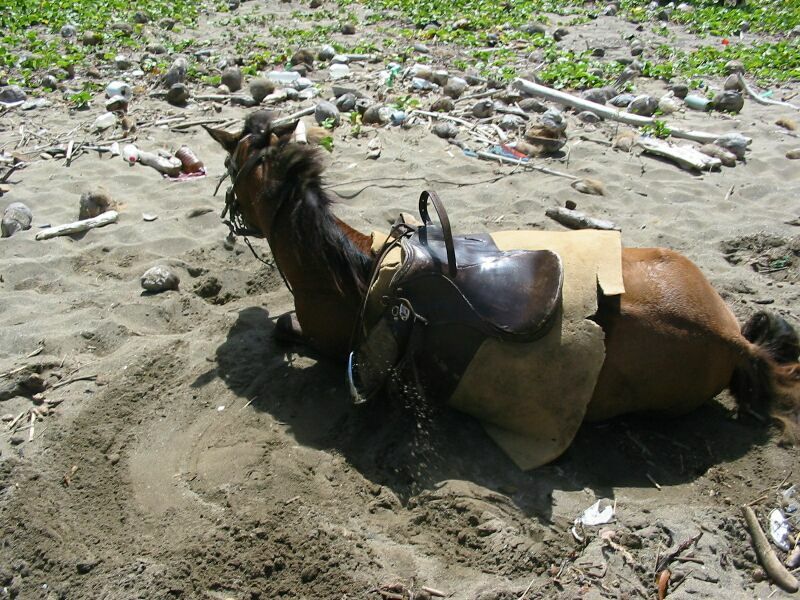 Frank's horse decided to lay down and take a roll in the sand. We had been warned this might happen and he quickly jumped off and took a picture. 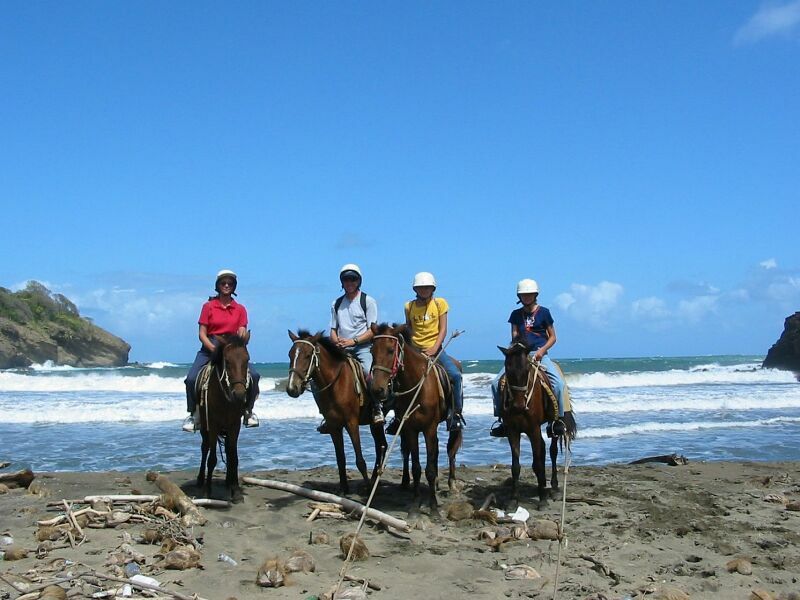 Here's the picture of the horse rolling, a shot of all four of us on the beach, a shot by Frank (on horseback) of the girls walking through the banana plantation. Those of us who did well with the trotting and cantering (all four of us) got to go back faster. The girls had no problem having ridden English saddle all their life, but Frank found it harder than Western saddle. We took the taxi back after our ride, and the only difference was that school had let out and we had to watch for children all along the road. We had smoothies after we got back to cool off. And then prepared for our trip to Bequia the next day. 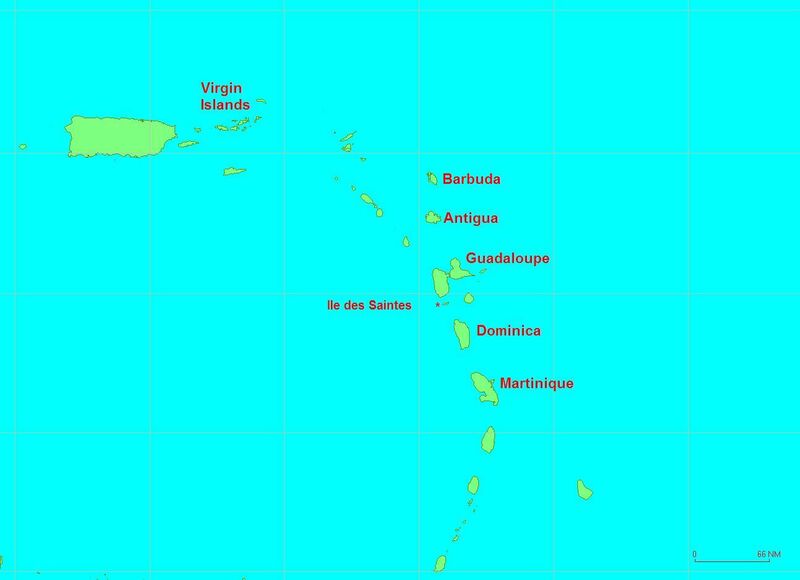 We had decided to go pass St. Vincent given that we only have the month of March left before heading back north for our Atlantic crossing. 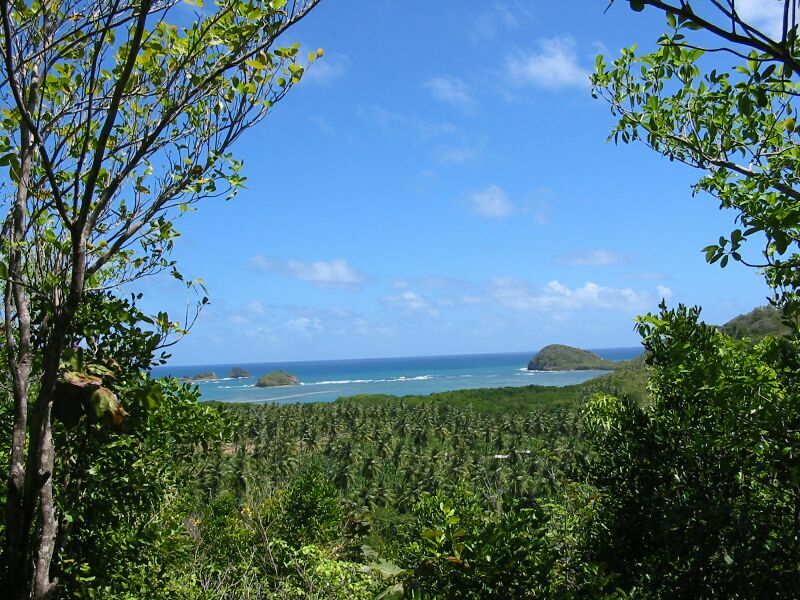 We want to spend at least two weeks in the Grenadines. 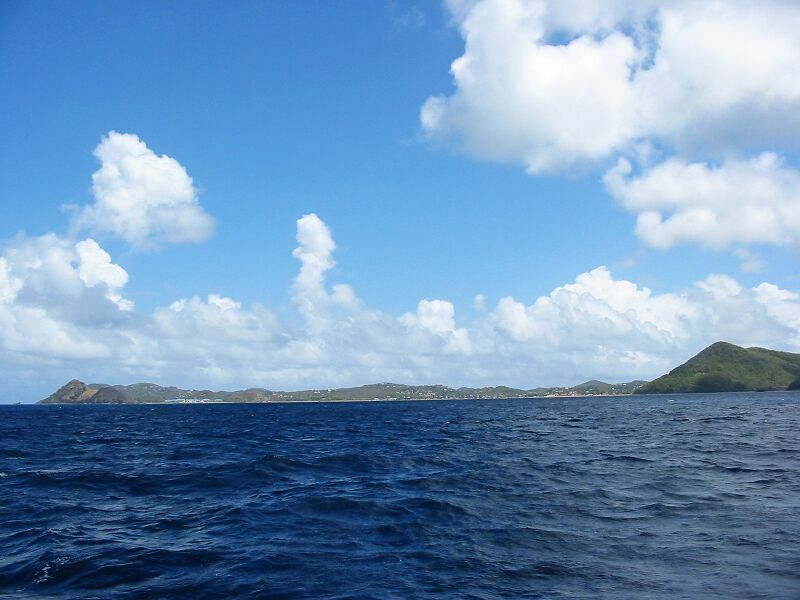 The passage to Bequia would be at least 62 miles so we needed to get an early start. The next morning, on Thursday March 6th, we left at 6:00 AM as quietly as possible so we wouldn't disturb our very nearby neighbors. We had a pleasant surprise as we sailed to Bequia, part of the Grenadines - we had been following another catamaran in the passage between St. Lucia and St. Vincent and finally caught up to them (since, of course, our boat is faster). It turned out they were Cajun Wind - the folks we met in Deshais, Guadaloupe who are from the U.S. 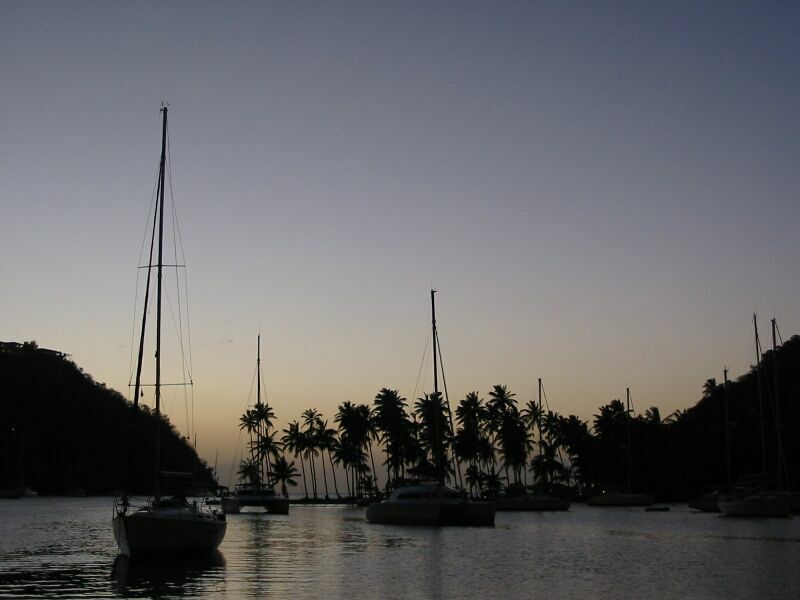 It turns out they were going to Bequia as well! More on this later when we write up our story about Bequia.